Happy New Year! A time for celebrations, resolutions and trying to remember to use the correct date! As we ring in another year, may I suggest making a commitment to understanding your personal wine collection. Whether you are intentionally aging wines or not, chances are there's a few bottles you are saving for one reason or another. As the years pass, do you know if those special bottles are aging gracefully? There is no doubt that wine changes over time. Actually, it may help to think of wine as being alive. Predictably, the life cycle of a wine will go from simple, bright fruit flavors to more complex and austere characteristics. Generally, wine that has been produced from high quality grapes, processed appropriately and stored under the right conditions will develop flavors that are complex and engaging. Often, the color deepens, aromas are intensified and flavor nuances allow the wine to be paired with a greater variety of foods. Remember, the vintage date on a bottle of wine is actually the year the grapes were harvested, not necessarily the year the wine was bottled or released. The process of aging wine involves a complex series of reactions between chemical compounds called phenolics, which are responsible for the color, aroma, flavor and astringency of a wine. Proper aging allows the tannins (organic compounds found in the skins and seeds of grapes) to taste less bitter and to improve the wine's overall flavor profile. When aging wine, it is important to note that every wine is different. Varietal, vintage, appellation and vintner are some of the main factors that make each wine unique and influence aging possibilities. Nevertheless, there are some general guidelines you can follow to aid you in aging your special wines. In general, white varietals age faster than reds. Fruit-forward style Chardonnay, Sauvignon Blanc and Pinot Grigio will lose their freshness with each passing year. Likewise, sweeter wines like Riesling, Gewürztraminer, Chenin Blanc and Muscat will also lose fruit character a couple of years after bottling. Higher end Chardonnay that has been produced in oak can age for five to ten years. Most Champagne and sparkling wines are ready to drink straight out of the cellar and don't benefit from additional bottle aging. Reds are typically aged longer than whites, but most are still designed to reach their peak drinkability at a young age. Cabernet Sauvignon-based (Bordeaux blend) wines can be aged longer than lighter reds such as Pinot Noir and Sangiovese. With proper storage, most California Cabernets will improve for ten to fifteen years past their vintage date while Pinot Noir, Merlot, Zinfandel and Syrah continue to improve for up to five to ten years. Compared to wines from other regions, Central Coast white wines develop more fruit character and red wines more tannins due to a typically longer growing season. 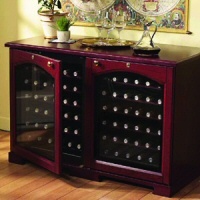 Proper storage conditions are one of the most important criteria for aging wine successfully. 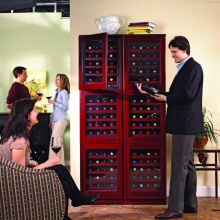 The longer you store wine, the more important appropriate storage conditions become. Constant temperature, bottle position and protection from light and vibrations are keys to successful wine maturation. Wine should be stored between 55-65oF and at about 70 percent humidity. High humidity is important because it keeps the corks from drying out and minimizes evaporation. Temperature has a major effect on the speed of which the chemical processes of aging take place. Variations of less than 3oF a day and 5oF a year are best. If the wine is allowed to get too warm, some aspects will mature and start to decline before other characteristics have had time to develop. When stored too cold, it will take many times longer for the wine to reach an ideal drinkability. Storing bottles in a horizontal position will keep the cork moist so that it does not dry out and allow air into the bottle. The best place to store wine, whether you're aging it short or long term, is in a climate controlled area without exposure to light or vibrations, both of which have been found to negatively affect the preservation of the wine. 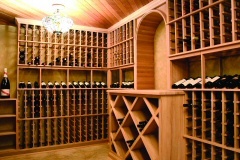 A basement/cellar is ideal for wine storage. The next best option is a ground floor closet. If you have made a long term investment in a quantity of fine wine you may want to check out of the regional commercial wine storage facilities or purchase a home free-standing, temperature-controlled wine cabinet. It may be surprising that more than ninety percent of all wines are designed to be consumed within a couple of years after they are produced. This is even more true today as contemporary wine-making practices allow for the production of wines that are fruitier, fresher and ready to drink. The tannic bite of a wine can be controlled, for instance, by late harvest, destemming and gentle pressing, so a particular wine can be enjoyed soon after its release. However, tannin is a building block for mature wines and is critical as a preservative, interacting over time with the fresh fruit to increase complexity and suppleness. In general, as wines age they gain complexity and lose fruitiness. It's just as possible to age a wine for too long as it is to age it for too short a time. So take the opportunity this year to inventory your personal wine collection, and make sure the wines you are saving are aging gracefully.